When MSC Divina arrives in Miami for year round cruises in November, it will begin a new era for MSC in the Caribbean. Not only will it be the first year round service in the Caribbean, but MSC Divina will bring features and a style of cruising to the Caribbean that most people haven’t seen before. Prior to her arrival in Miami, a couple of major new features are being installed on the ship, and there will be a couple of other major features already on the ship but new to the Caribbean. Last night the Miami Heat won the NBA championship in the seventh game of the series. Thanks to satellite technology, Heat fans could watch the game virtually anywhere in the world - even on a cruise ship while at sea in the Mediterranean. Miami police officer - and avid Heat fan - Winsor Lozano is seen here aboard Carnival Sunshine cheering the Heat victory this morning as the ship sailed a few miles off the coast of Naples, Italy. 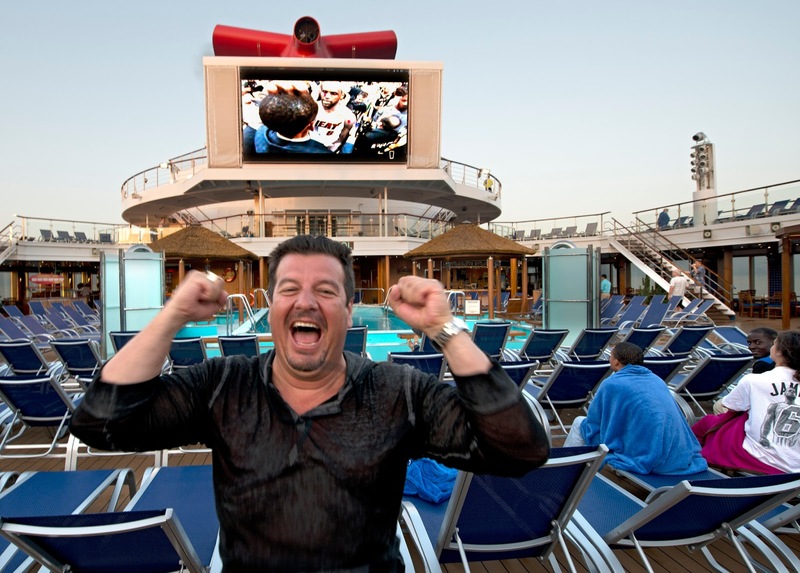 Heat fans aboard Carnival Sunshine had to stay up until 6am local time in Italy to see the last basket in the ship's outdoor Seaside Theater on the Lido Deck. The ship boasts a new 270-square-foot LED screen. Carnival Corp's chairman wasn't there, however. Micky Arison also owns the Miami Heat, and he was in Miami for the game. Entertainers in the shows aboard cruise ships rotate on and off the ships all the time. When they get to the ship, they’re expected to be ready to be in the shows right away. There’s no time for them to learn the songs or the dances once they’re aboard the ship. So where do they learn their parts if they don’t do it on the ship? In Norwegian Cruise Line’s case, the answer is just outside Tampa, Florida. CND subscribers also read about the more "useful" side of the ship ... and duck, duck, goose! The SeaWalk aboard Princess Cruises' new Royal Princess seems to be getting a lot of attention, but we think it's sister feature, the SeaView Bar, on the other side of the ship is a lot more interesting - and useful. 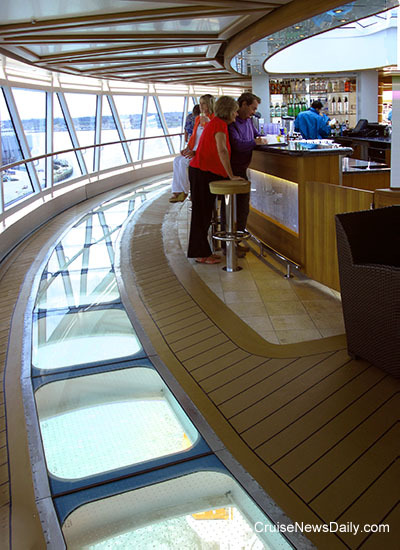 The SeaView Bar, on the starboard side of the ship's pool deck, is shaped just like the SeaWalk, and you can still walk out 28 feet beyond the side of the ship and look down through the glass deck to the sea 128 feet below, but instead of the open hole in the middle, the SeaView Bar fills up hole. Sit on the "outside" of the bar and you can look down through the windows to the sea below or out through the "picture windows" to the expansive horizon. Sit on the "inside" and you have a great view of the top deck, the giant Movies Under the Stars screen (30% larger and more brilliant than on other Princess ships) and the Dancing Fountains show. But twice a day - at midday and sunset - the SeaView Bar is itself the site of an eye-popping show - Princess' flair bartenders' show where you will see the experts do their fanciest (but impractical) bartending. Photo copyright Cruise News Daily, all rights reserved. SINGAPORE (June 20, 2013) – Paul Chong is joining Carnival Asia as its new vice president, business development to assist in implementing the company’s growth strategies within the rapidly expanding Asia region. The position reports to Pier Luigi Foschi, chairman and CEO of Carnival Asia. Chong will be primarily responsible for Carnival Asia’s strategic priorities in government relations, port infrastructure and destination development, and port operations and guest services. This includes developing strategic partnerships, identifying investments and acquisitions in key markets or destinations, and expanding the reach of Carnival’s brands in Asia. He’ll also work to further develop cruise industry associations in the region. Chong joins Carnival Asia after nearly 13 years with the Singapore-listed luxury hotel and resort group Banyan Tree Holdings Limited where he was responsible for the group’s global business development efforts and also served as the group’s general counsel. As the head of business development for the Banyan Tree group, Chong was instrumental in expanding the “Banyan Tree” and “Angsana” brands into key markets, including the Americas, the Caribbean, the Middle East, Europe and China. “As we build our presence in Asia, we welcome Paul as a member of the initial team at Carnival Asia that will support Carnival Corporation & plc’s brand efforts to expand our presence and business in this most promising region for the cruise industry,” said Pier Foschi. “Paul has a remarkable track record of achievements and excellent people skills. We are very pleased to have him join us,” Foschi added. Chong began his tenure at Banyan Tree Group as legal manager and took on increasingly important roles and functions. He was director of 58 companies within the group and the joint company secretary of the listed parent by the time of his departure. This was in addition to his principal role as vice president business development and general counsel. Trained as a lawyer and called to the Singapore bar, Chong previously practiced in leading law firms including Messrs Allen & Gledhill and Messrs Rajah & Tann. Holland America will continue to build their presence in the Caribbean this winter with eight ships and a very diverse group of itineraries all centered on making these cruises easy to take. Holland America will have eight ships in the Caribbean this winter with 109 sailings. Aboard, they will all have Holland America’s unique, premium ambiance. CND subscribers also read about Silversea's 2015 world cruise ... and an unexpected Alaskan adventure. Fincantieri cut the first steel today for Viking Ocean’s Viking Star, Viking’s first oceangoing small cruise ship. The Port of Tampa reports that Carnival Corp has signed an agreement with the port to homeport ships there through 2015 with options for two one-year extensions. The agreement covers both the Carnival and Holland America brands. Carnival has sued BAE Systems, where Carnival Triumph was being repaired in Mobile, over the incident where the ship broke free of its moorings during high winds on April 3. The suit is seeking more than $12 million in damages. Seattle, Wash., June 18, 2013 — Holland America Line hosted a sponsor luncheon for Seafair, one of the company’s community partners, aboard ms Westerdam Saturday, June 15, 2013, at the Port of Seattle. Following remarks by Seafair President and CEO Beth Knox, guests enjoyed a special luncheon in the main dining room. The event concluded with a presentation in the ship’s Vista Lounge by hydroplane racer and renowned sportsman Chip Hanauer, followed by a ship tour. The Seafair Foundation celebrates and rewards cultural diversity, education and community engagement in Greater Seattle. It was established to create and build opportunities for Seafair's Scholarship Program for Women, Ambassador Program, Holiday Cruise, Youth Education Program and the Seafair Sanctioned Community Events. As an extension of the Seafair Festival — Seattle’s annual summer festival, a month-long, region-wide event — the foundation has given Seafair an additional avenue to direct resources toward making a greater impact on the community. For more information, visit www.seafair.com. Each year, Holland America Line hosts more than 25 shipboard charity luncheons for nearly 5,000 guests in its homeport cities. In addition, Holland America Line and its corporate foundation’s charitable-giving programs provide cash sponsorships, in-kind donations, free- and reduced-fare cruise donations for nonprofit fundraising events, donations of usable shipboard items around the world, employee volunteerism and other philanthropic activities. MIAMI (June 18, 2013) — Carnival Corporation & plc (NYSE/LSE: CCL; NYSE: CUK) has appointed Roger Frizzell to the newly created position of senior vice president of corporate communications, effective June 24, 2013. Frizzell will report to Carnival Corporation & plc Chairman and CEO Micky Arison and Vice Chairman and Chief Operating Officer Howard Frank. In his new role, Frizzell will serve as Carnival Corporation & plc’s chief communications officer, handling all corporate-level communications and public relations activities for the world's largest cruise vacation group, which is the parent company of 10 cruise lines. Frizzell most recently was vice president and chief communications officer for Pacific Gas & Electric in San Francisco, Calif. During the course of his 30-year career, Frizzell served as a top public relations executive at American Airlines for nearly a decade, as well as held high-level communications positions at Hewlett-Packard, Lucent Technologies and AT&T. He was inducted into the PR News Hall of Fame in 2011 and named by the Holmes Report as one of the top chief communications officers in the industry. When Cunard decided to recreate the ambiance of The Verandah restaurant that was on the original Queen Elizabeth for the new Queen Elizabeth, the specialty restaurant became an immediate hit. They’ve now brought The Verandah to Queen Victoria. The suspension of Celebrity Xpedition’s license to enter the Galapagos National Park has been lifted. The ship will return with the June 30 sailing. The bad news is that means one additional sailing, June 23, must be canceled. * Costa President DepartsCosta Crociere today announced their president, Gianni Onorato, has resigned his position effective immediately. GENOA (June 17, 2013) -- Gianni Onorato, president of Costa Crociere S.p.A., has announced his decision to leave the company, effective immediately, to pursue a new career direction. "I regret Giannis decision," said Costa Crociere S.p.A. Chief Executive Officer Michael Thamm. "He has played an important role in the development and growth of Costa Crociere. Personally and on behalf of the whole company I want to express my gratitude to Gianni for having contributed to the success of Costa. I wish him the very best for his personal and professional future."